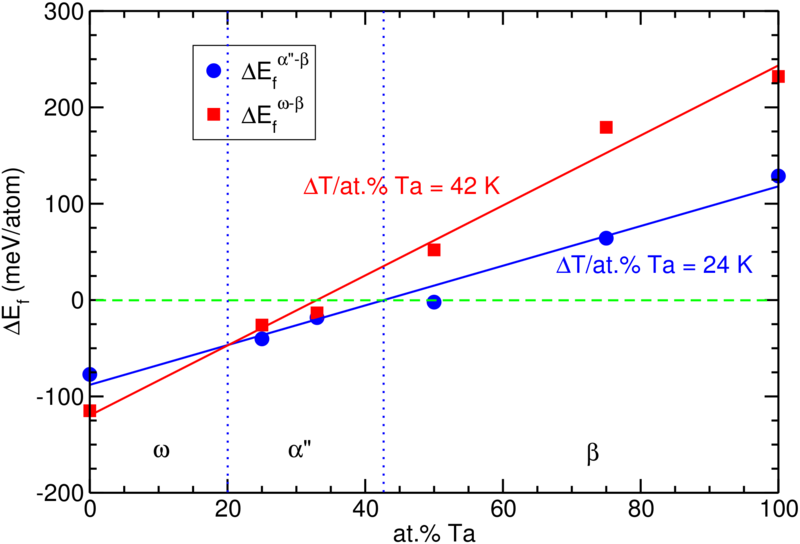 Difference in formation energies between the martensite α and austenite β phase(blue circles)as well as between the ω and austenite phase(red squares)in Ti-Ta high-temperature shape memory alloys as a function of Ta concentration.Vertical lines mark the stability region of each phase. A combined density functional theory and solid-state nudged elastic band study is presented to investigate the martensitic transformation between β → (α", ω) phases in the Ti–Ta system. The minimum energy paths along the transformation are calculated and the transformation mechanisms as well as relative stabilities of the different phases are discussed for various compositions. The analysis of the transformation paths is complemented by calculations of phonon spectra to determine the dynamical stability of the β, α", and ω phase. Our theoretical results confirm the experimental findings that with increasing Ta concentration there is a competition between the destabilisation of the α" and ω phase and the stabilisation of the high-temperature β phase.